Although deployment of Oracle ADF 11g web applications on Tomcat is not officially supported, we have successfully deployed several ADF 11g applications on Tomcat 6. In fact, once you know which adjustments need to be made, it is easy to deploy an ADF application on Tomcat. This post will show you how it can be done and includes a small app which lets you browse departments in Oracle’s sample HR-schema. On Tomcat, we can only deploy a Web archive, so we need to make a .war file. 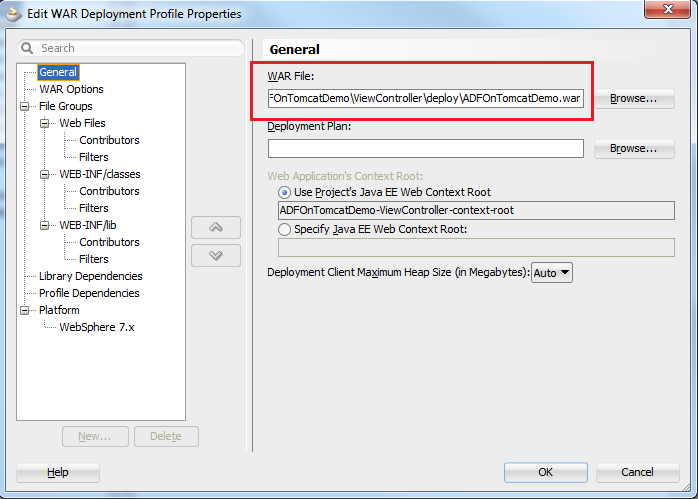 This can be done with a deployment profile on the ViewController part of your project. 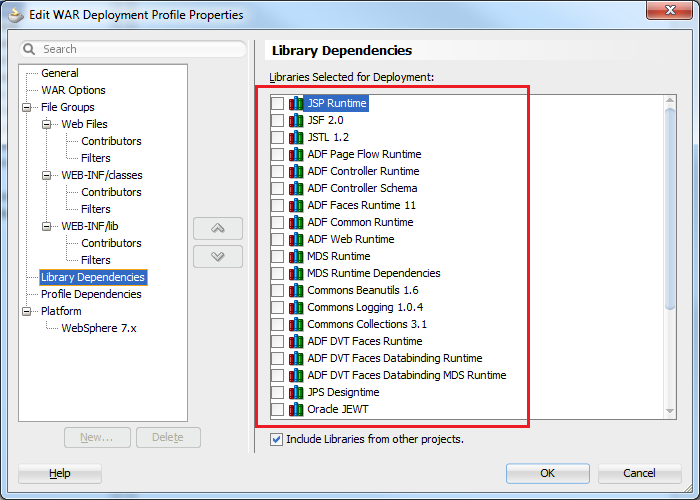 In this profile we will exclude all library dependencies. Apart from that, we need to remove some lines in the web.xml file of our application: all web application listeners need to be removed, and the lines related to JpsFilter need to be removed. Below I will explain these steps in detail, using a sample application named ADFOnTomcatDemo, which is available for download. After that, we are going to make a new deployment profile: right click the ViewController part of the project and choose “Project Properties”. Select “Deployment” on the left and click the “New…” button to make a new deployment profile. Choose Profile Type “WAR File” and give it a name, for instance “ADFOnTomcatDemo”. This will also be the default name for our WAR-file, but we can change that later on. After clicking OK, we get into the screen for editing profile properties. In the category “General” we can change the WAR filename. This filename is important, because it will be the root-context for our Tomcat deployment and thus appear in the URL for our application. Check that we have the right name for our WAR file, and also check the file location, because we will copy the war file from here to the Tomcat webapp directory. Then click OK. The deployment profile is ready now. Next, we will have to make some adjustments in the web.xml file of our project. Double click this file in the WEB-INF folder and expand the Web Application Listeners part. Delete all three entries that appear here. That’s all. Save the adjustments and make a war-file, using the deployment profile we just made. 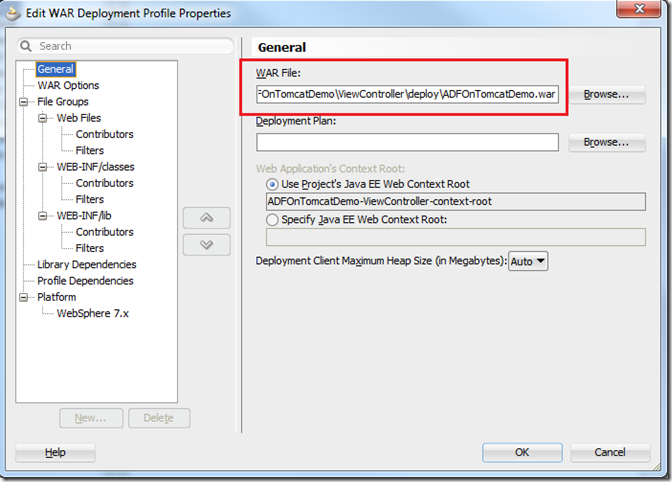 For this, right click the “ViewController” part of our project and choose “Deploy” to WAR-file. A WAR-file with the name ADFOnTomcatDemo.war will be made and you will find it in the deploy-directory within the ViewController-directory if you have accepted the default location. Now we need the stop the Tomcat server, if it’s running, delete the previous entry in the webapps/ folder and put our WAR-file in there. provided that Tomcat is running locally and configured at the default port 8080. The sample application can be downloaded at: ADFOnTomcatDemo. Edward Orlowski is active in IT since 1996, and has a lot of experience with Oracle development tools. Currently, his main interest is ADF, but he also has a thorough knowledge of SQL, PL/SQL and the RDBMS. I have tried replicating your post and every time I am getting “Access Denied” on the component area, how ever rest of static content on the page is loading fine. Any idea what might be going wrong here ? Thanks a lot for you post…. Its working…. Thanks a lot for you post EDWARD ORLOWSKI. I configured my tomcat and my application in jDeveloper also. But we have one problem we are able to run .jsp pages in browser but when we run .jsf page we are unable to see exact output and we are getting the page xml code. Thanks. 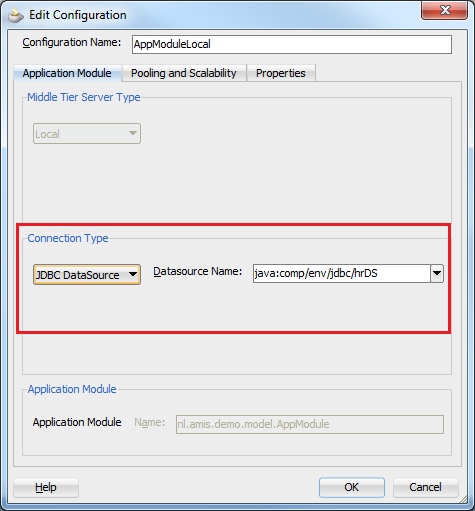 I would like to use JBoss but have not been able to find instructions for the. 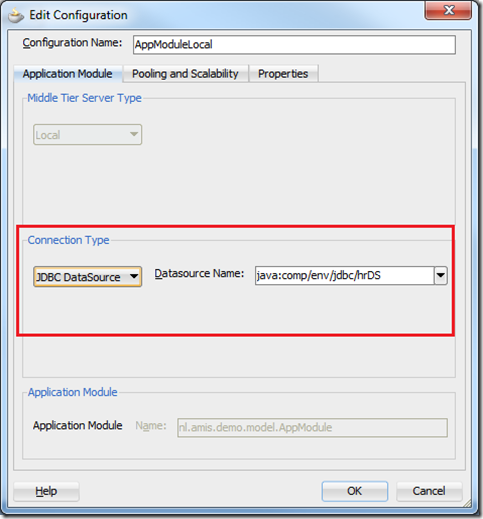 Have you tried it or do you have any pointers how adf could work with JBoss? But when I try it into the tomcat doesn’t work and doesn’t browse through the pages. i deployed succefully my demo application adf essentials 11.1.2.3 on tomcat 7.0.47. the application is working fine, but when i try deploy the same application migrated to adf essentials 12.1.2 on the same tomcat 7.0.47 instance the deployment was succefully but at runtime the connection with the database is not working. 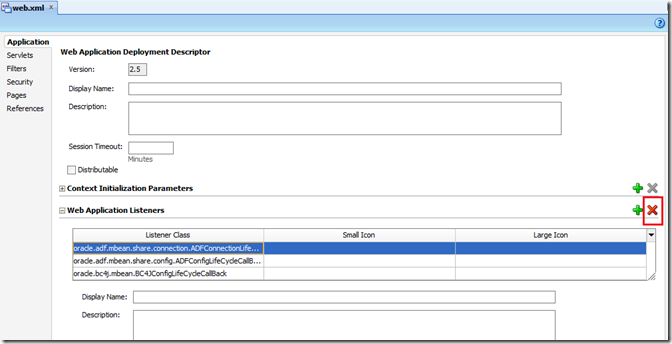 adf app 11.1.2.3 with Adf Model works on tomcat but the same example for adf 12c (with adf essentials 12.1.2) is not working. 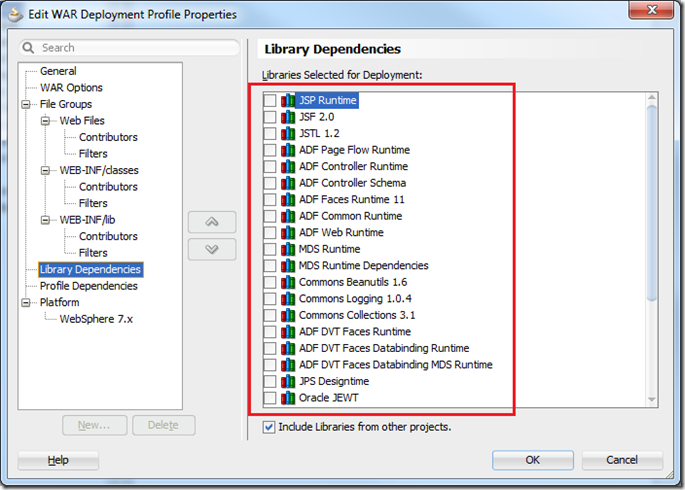 Only Adf Faces 12c app without Adf Model works good. Please where is an example for 12.1.2 ADF ESSENTIALS on tomcat.